Our Chemical Hearts is a gorgeous quick read that takes a few unexpected turns as our main protagonist Henry Page tries to undercover the mystery of Grace Town, a girl with a tragic past. But what Henry doesn’t realise is how greatly her past has impacted her present lifestyle. With Grace as Henry’s main forefront of his thoughts and the slow detriment of his priorities as dream school editor, he soon learns a lot about himself, his family and his friends’ and that love isn’t always how you expect it to be. I adored the characters contained within the pages of Our Chemical Hearts and the contrast among each character and their family members. It was great having them present throughout the story so that the plot wasn’t wholly based upon love but also about friendship, family and growing up. I enjoyed the interactions between Henry and Grace when they were together and the little quirky conversations they had throughout their texts and in person. The characters felt realistic and honest which caused me to become thoroughly invested into Krystal’s book and ended up completing the book in one sitting. My favourite thing about this contemporary read was the moral of the story about how one should love someone for who they really are and not just the idea of them. Henry Page had a fun and refreshing personality that mirrored the kind of personality you look for in a friend, as he was humble, yet witty with his own little quirks. As for Grace Town, she was mystery that was hard to understand at times, yet you could apprehend some of her infuriating actions for you can’t fault someone for trying to cope with their own inner pain. Overall, I was content with the ending of this story as it was quite realistic and honest; displaying a new angle of loss and the dealings of guilt and sadness and how everyone can express it differently for grief occurs differently for everyone. Staying out of trouble isn’t possible for Julep Dupree. She has managed not to get kicked out of her private school, even though everyone knows she’s responsible for taking down a human-trafficking mob boss—and getting St. Agatha’s golden-boy Tyler killed in the process. Running cons holds her guilty conscience at bay, but unfortunately, someone wants Julep to pay for her mistakes…with her life. Against her better judgment, Julep takes a shady case that requires her to infiltrate a secretive organization, one that may be connected to her long-gone mother and the enigmatic figure called the blue fairy. Her best friend, Sam, isn’t around to stop her, and Dani, her one true confidante, happens to be a nineteen-year-old mob enforcer whose moral compass is as questionable as Julep’s. But there’s not much time to worry about right and wrong—or to save your falling heart—when there’s a contract on your head. Murders, heists, secrets and lies, hit men and hidden identities…If Julep doesn’t watch her back, it’s her funeral. No lie. This book was a riveting sequel that I loved with its sassy and incredibly entertaining characters. Trust Me, I’m Trouble, is a beautiful young adult suspense series that continues to follow our main protagonist, Julep, as she continues to go about her seemingly ‘normal’ life whilst being a grifter, or better known, con artist. After following her father’s footsteps in running schemes after her mother had abandoned her and her father, Julep has a new case to solve where she must infiltrate a secret cult organisation that may be connected to her mother and the famed Blue Fairy. However, there are new dangers lurking in the shadows, including the fact that her head is now a target on a hit contract. One of the many great things I love about Julep’s character is how she is an anti-hero for she is not only a con artist and a criminal, but she solves important worthwhile cases. The story is told through her perspective throughout the entire book, which is a perfect way to introduce the story as I quite enjoy the conversational tone of a first person perspective as it allows one to easily slip straight into the story. This book kept me on my toes with its fast pace and twists as you watch Julep grow and learn from her mistakes as she came to realise that ignoring your problems doesn’t make them go away, and that just because you wish to believe that someone still has good within them, does not always mean that they will change who they are. The bittersweet romance was of the perfect blend in this sequel as the author gave us something we didn’t know that we needed. I adored how Julep has a potential romance with Dani, where her bisexuality is bought to the surface, as Dani understands some of the things Julep has been through. I love how she won’t dare push Julep into opening up until she is ready to leave her comfort zone, willingly. It was also incredibly entertaining to watch the two characters skirt around each other and to see that Dani was just as closed off as Julep. I enjoyed how the book ended with the strong ending with each chapter getting better than the last. 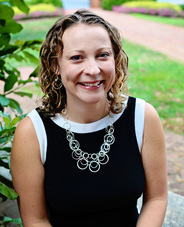 Mary Elizabeth Summer contributes to the delinquency of minors by writing books about unruly teenagers with criminal leanings. She has a BA in creative writing from Wells College, and her philosophy on life is “you can never go wrong with sriracha sauce.” She lives in Portland, Oregon with her wife, their daughter, their scaredy-lab/pitbull, and their evil overlor—er, cat. She's the author of the TRUST ME series, of which TRUST ME, I'M LYING and TRUST ME, I'M TROUBLE are out now, and a third is in the works. First off, I would just like to take a moment to appreciate the gorgeous cover designs that reflect the dark edge that comes alongside these tales, and not to mention, the gorgeous coloured text on the inside that made the reading journey all the more special and unique with it’s dark re-telling. Unhinged took off with Alyssa trying to fight for the life she chose after her last journey in Wonderland. Despite struggling to keep her netherling side under control, Alyssa’s life has returned to her old norm with her mother by her side and her devoted boyfriend Jeb being there for her. However, with only a matter of days before her graduation, unexpected surprises come hurtling back from the past. With Wonderland not quite being done with her, she discovers that her court may be in immense danger. The only question left is, should she continue living the life she chose, or the one she was born to save? What else is one to do when you’re a descendant of Alice from the original children’s tale by Lewis Carroll. I cannot wait to see how this series will end as the ending to this book couldn’t have been more perfect with the plot line coming back to complete the full circle. Despite Unhinged not being set in Wonderland, we still got the chance to see all the whimsical creatures with the increasing appearances of things that shouldn’t exist in Alyssa's human world. With her worlds starting to collide, Morpheus makes a sudden appearance in the human world as things start to get a whole lot more complicated. With Jeb having not yet recovered his memories from this time in Wonderland, a darker side of Alyssa is shown where her desires wish to break free from her loyalty towards the boy she believes she loves, and to race her attraction towards Morpheus as the want in her heart starts to become impossible to deny. With her mother holding her back from her destiny and Morpheus urging her to take it, Alyssa is stuck between the decisions of her two worlds with each ones survival in her hands. A.G. Howard was inspired to write SPLINTERED while working at a school library. She always wondered what would've happened if Alice had grown up an the substle creepiness of Alice's Adventures in Wonderland had taken her stage in her story, and she hopes her dardeeer and funkier tribute to Caroll will inspire readers to seek out the stories that won her heart as a child. Her pastimes are reading, rollerblading, gardening, and family vacations which often include impromptu side trips to 18th century graveyards or condemned schoolhouses to appease her overactive muse. It is said that the fey are the greatest danger in the world to humans. The fey have no mercy when it comes to torturing their victims as they rip them from limb to limb. Shred to shred. These are the stories children have been told, ever since they could walk. Since the Great War between both fey and humans alike, the mortals have avoided all contact with the fey at necessary costs. Thousands of mortal’s died in the war, but peace was bought amongst them as the treaty was signed. The treaty was simple. Follow these three conditions, and the peace may be kept. 1. Fey cannot keep the humans as their slaves. 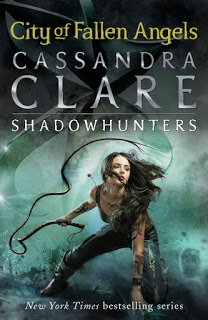 When 19-year-old huntress Feyre treks deeper into the woods, closer to the wall where the fey lurk, she hopes to find a healthy catch to feed her starving family, who are dependent on her. When she spots a beautiful silent doe, Feyre can’t believe her luck! But she’s not the only one hunting the doe. There lurks a wolf. Allowing the wolf to hunt its prey, Feyre hopes that she can then later kill the wolf for its pelt. Though there’s something cunning in the way the wolves looks. It looks almost fey, but it can’t be. The wall has protected her people for years, keeping them out of their lands. Later that night when all is well and peaceful, a beast-like creature arrives to demand retribution for the death of the wolf that was killed by Feyre’s arrow. She is given two choices. Die a painful and miserable death or be dragged into a treacherous magical land she only knows about from legends. It is then she realises her fatal mistake. It was no wolf she killed, but fey. And the beast-like creature before her is not beast, but Tamlin – one of the lethal, immortal faeries who once ruled their world. 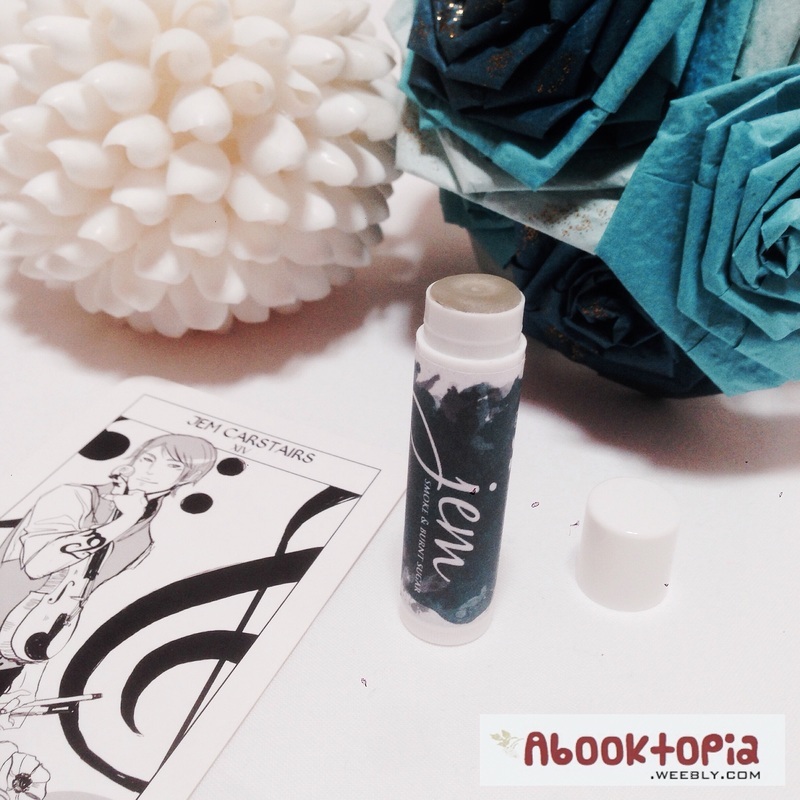 The world building was immensely detailed throughout the book as we read from Feyre’s perspective, which helped us as readers connect with the protagonist. Feyre was just as witty and incredibly as she was strong headed with determination and stubbornness. To be honest, there are probably not enough adjectives in the eniglsh dictionary, let alone human language that could even begin to describe just how memorising this retelling of Beauty and the Beast is. I adore how it diverts from the traditional stories, and how it has so many deep and meaningful messages throughout the novel. I am beyond excited for the second novel, and cannot wait for it to be released into the world! 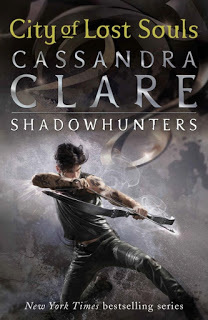 I quite enjoyed this adaptation and found that the pacing suited the book well as it illustrated all the important scenes that appeared in the first third of City of Bones, up to Magnus Bane’s party, and even included some other smaller details. However, it would have been preferable to have the entire contents of City of Bones in this single volume as a larger and thicker copy, rather than having the one book split into several graphic novels. Though, I am glad that Cassandra Jean has chosen to include most scenes from the book, rather than fast pacing and skipping the extra information. The art is simplistic, easy on the eyes and represents each character well enough, despite Isabelle’s character not quite picturing up to some of Jean’s past work. Although readers should keep in mind that the characters are of fifteen to sixteen years of age, so having less remarkable features on their character art, allows for them to appear more youthful and innocent before the hardships they all endure throughout the course of this series impacts their growth. It is to be noted that the publisher also ended up using an earlier version of Jean's artwork for the first chapter in the volume, which resulted in some last minute changes such as Simon's hair and his glasses that were not included original in the draft. This has caused the chapter to be different from the rest of the graphic novel. Overall, this graphic novel was an exciting and enjoyable read as it was great seeing all the characters again in a well-loved series, but this time, bought to life through art. This book is definitely a great read for those who wish to jog their memory on the contents of what occurs in The Mortal Instrument, in a fun, light and easy way. I was kindly granted the opportunity to review this marvelous Dragon's Hoard subscription box, which I came to quickly love. The box I received had a theme of 'Music is All Around'. 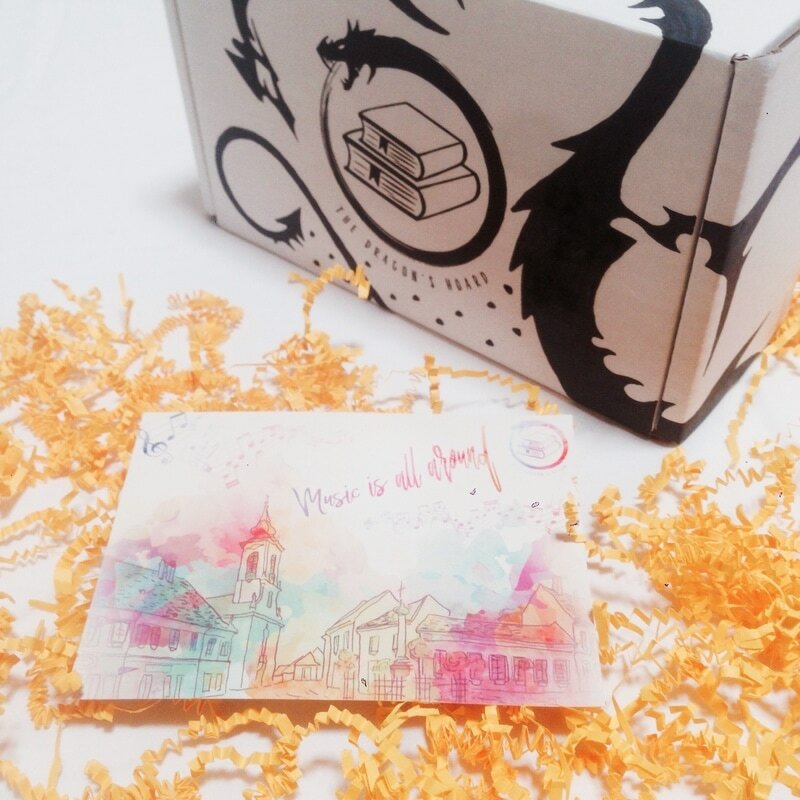 The Dragon's Hoard Box is a monthly subscription crate based in Australia, that firmly supports small Australian businesses as they will always seek to include Australian-made-goodies amongst their monthly bookish merch. The Dragon's Hoard is a wonderful home run business that provides a reasonable alternative for booklovers in Australia who are looking for something closer to home, or just something with a new and different focus. 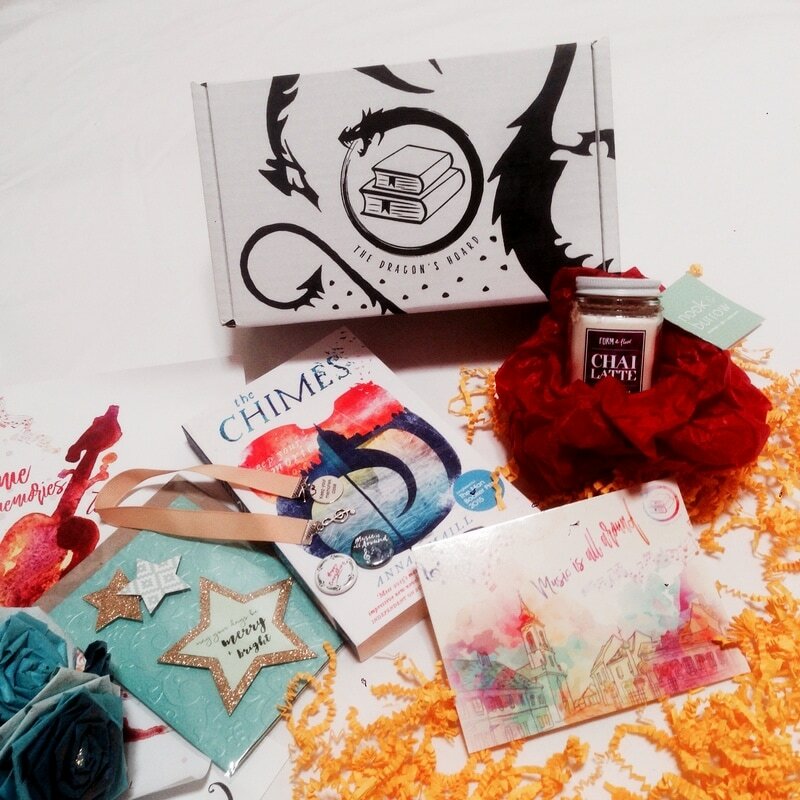 Each YA book subscription box supplies a paperback YA books based upon a monthly theme that is loosely classified as Fantasy/Sci Fi, with 3-5 bookish merchandise and goodies. Each crate costs about $30.00 AU. Also please note that the dragon drawn around the middle logo, is not a part of the original box design, as my had mother accidentally written on the from of the box, so I covered up the scandlous writing with a drawing of a dragon to match the box's design. Australia misses out or pays a fortune to share in the love sometimes. That’s where The Dragon’s Hoard Box comes in! We want to provide a reasonable alternative for booklovers on our side of the world looking for something closer to home, or just something with a different focus. We welcome people from all over the world. Whether you’re an old hand at the SFF thing, or you really liked the Fantasy or Science Fiction elements you encountered in other genre books, you’ll find something in our books to love. I watched the movie before reading the screenplay, and adored both of them so dearly. As I read through the screenplay, I could vividly picture each scene from the movie, stark clear. Reading it was like seeing the movie all over again! There is great attention to the screenplay as there is so much detail of each scene alongside the chapter designs, which are absolutely gorgeous to look at. The screenplay doesn’t add much new stuff to the movie, however it does give a few little details and confirmations that one may not have picked up in the movie. The world building and characters are absolutely amazing and I cannot help but love Newt Scamander’s quirky, awkward and quiet personality where he never really quite looks at people in the eye and tilts his head to the side with his little awkward side steps. Though he is shy, when he conversely enters inside his case with his creatures, his whole demeanour changes as he is in his own element. Some of his purest moments were when he completed a mating dance with his erumpent (which I couldn’t help but squeal due to his adorableness in that moment) which was so honest and pure as he was not ashamed of anything at all as he only cared about the wellbeing of his erumpent girl as he wished to get her back safety in his trunk where humans could not harm her. Despite not being an actual hero, Newt Scamander is as hero worthy has his older brother, as he is only worried about the wellbeing of his creatures and friends due to his big and caring heart. Each and every character was amazing and unique in their own ways with Jacob being an easy going and loveable barrel of laughs and Queenie was the suitably a queen (just as her name suggests) with her cute giggling nature that is so caring and girly-girl like, whilst her sister Tina was also just as wonderful with her worrying nature as the responsible one. The Devious Dr. Jekyll is the sequel to Viola Carr’s ‘The Diabolical Miss Hyde’, which is an extension of the infamous tale of Dr. Jekyll and Mr. Hyde that follows the story of his daughter Dr. Eliza Jekyll and her dark side Miss Lizzie Hyde who resides within her. Sharing the same body, Dr. Eliza Jekyll, a forensic investigator, continues to be at odds with her other half, Miss Lizzie Hyde who lurks in the shadows at night as an unapologetic woman who knows nothing of boundaries. Both reluctant to give the other dominance over their shared body, they must learn to work together when their mutual existence could be compromised with a serial killer on the loose, followed by uncanny rituals. As Eliza comes to uncover the truth behind the mystery of the gruesome and unnatural killings, her darker side, Lizzie, has grown restless of living in the shadows… But that’s not the only issue. There is more to the murders than anyone ever could suspect. It soon becomes clear that the murders are part of a bigger picture that could have deadly consequences, and Eliza is caught up in the middle of it all. Overall, this book is packed to the brim, full of murder, mystery and mayhem with dark twists turning everything you know upside down. Eliza and Lizzie’s complicated relationship continues to be full of surprises. Despite them sharing the same body, the two characters prove to be completely different entitles with their own unique and dynamic personalities where they each have different characteristics that define them. Viola also writes urban fantasy adventure and dark paranormal romance under a pseudonym known as Erica Hayes. 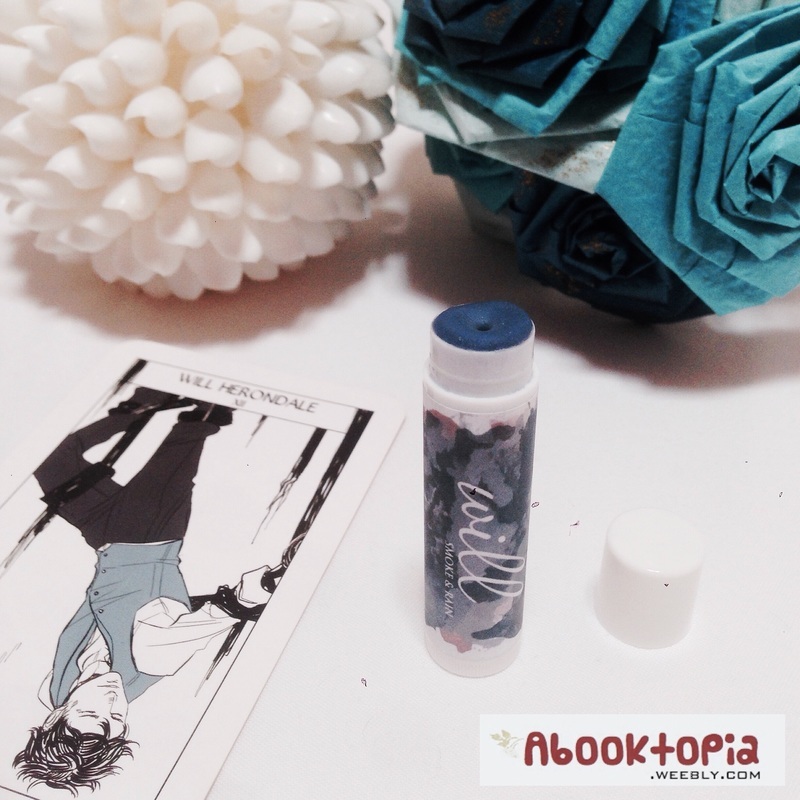 These character lip balms are a must have for every book nerd out there! They are honestly without a doubt, one of the best lip balm products you can get out there as they are guaranteed to hydrate and moisturise even the driest of cracked lips. 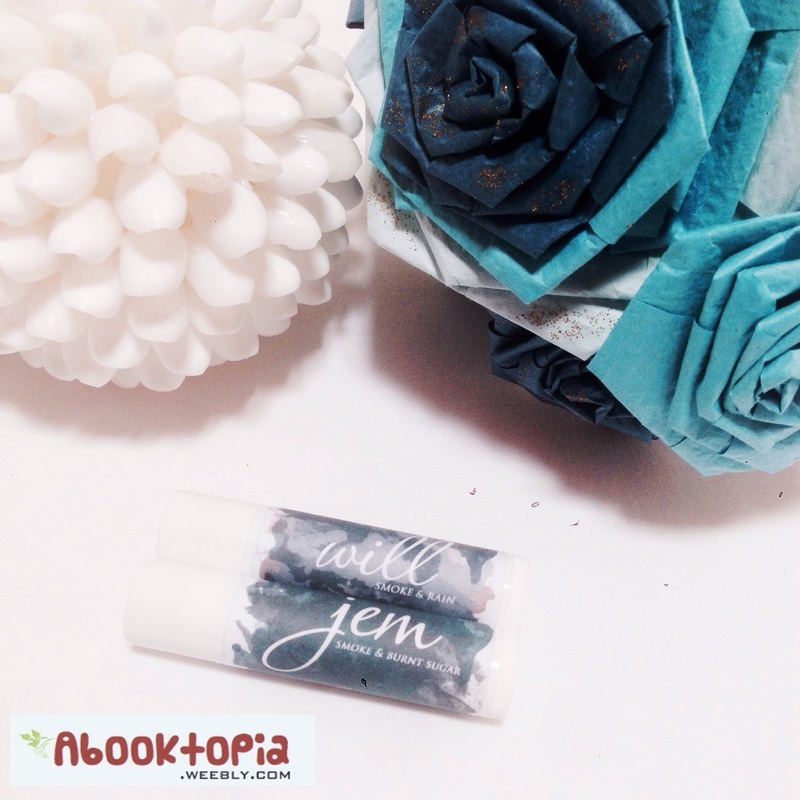 I love how the lip balms are naturally coloured with mica that applies transparent on your lips with a bit of natural simmer that glistens in the light and leaves your lips feeling soft and supple with an extra bonus of your lips smelling just like your favourite book character. The texture of each lip balm applies smoothly onto your lips with the perfect blend of fragrance oils and natural ingredients. 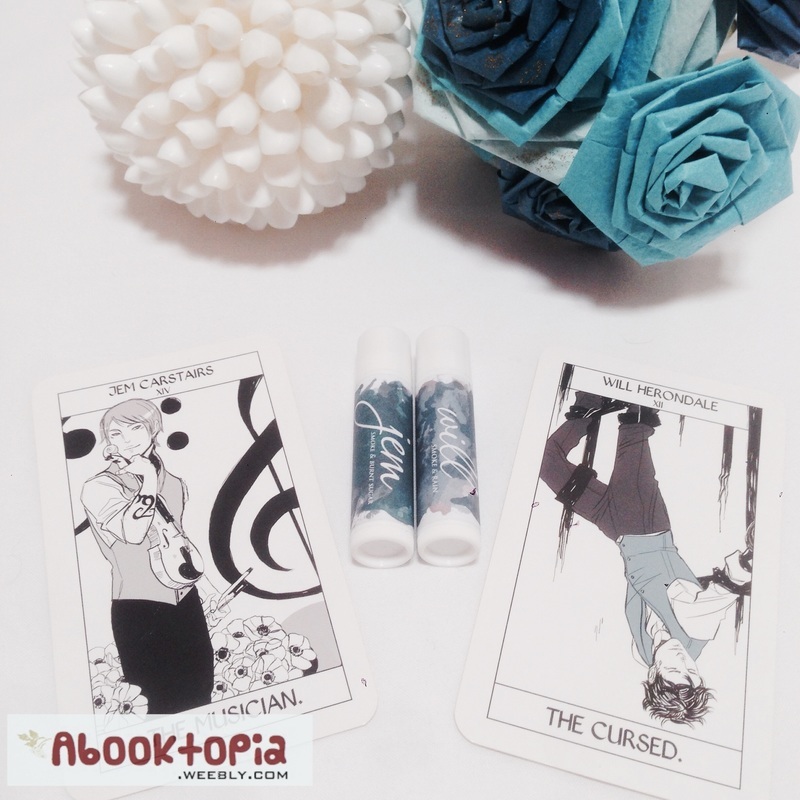 As you can see in the pictures below, I received my favourite Parabatai pairing, Jem Carstairs and Will Herondale, from The Infernal Devices by Cassandra Clare. Will’s scent is described as ‘Smoke & Rain’, which is the perfect description as the scent is quite musky and hard to determine just like his character. 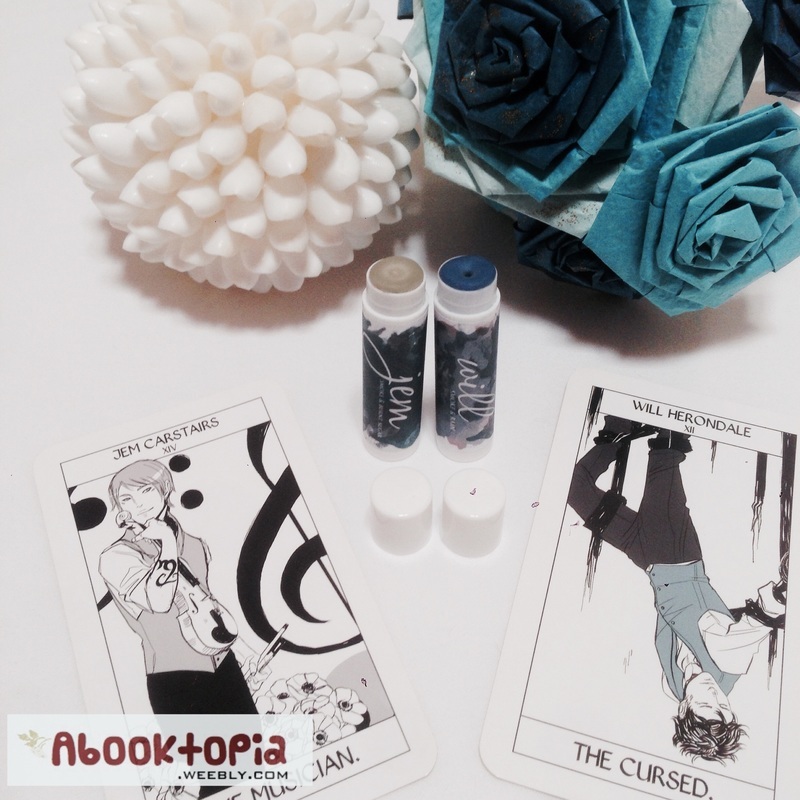 As for Jem’s character lip balm, it smells delectable with its ‘Smoke & Burnt Sugar’ scent that has quickly come to be my favourite. Every product from Behind The Pages is made from all natural ingredients that are perfect for those who have sensitive skin. I have been using this product and cannot recommend it highly enough! So what are you waiting for? Pucker up and check out those kissable lip balms from Behind The Pages and all their other wonderful products. Also please note that handling times may vary as each product is made to order. At Behind the Pages, bookmarks and posters are all digitally designed by our fairies then magically printed out with sparkle and foil. Our 3D book collages are made with extremely well loved second hand books and turned into 3D beauty. Don't forget the newest addition to the store with the Bookish Soaps. You can now take your fave book boyfriends into the shower with you. 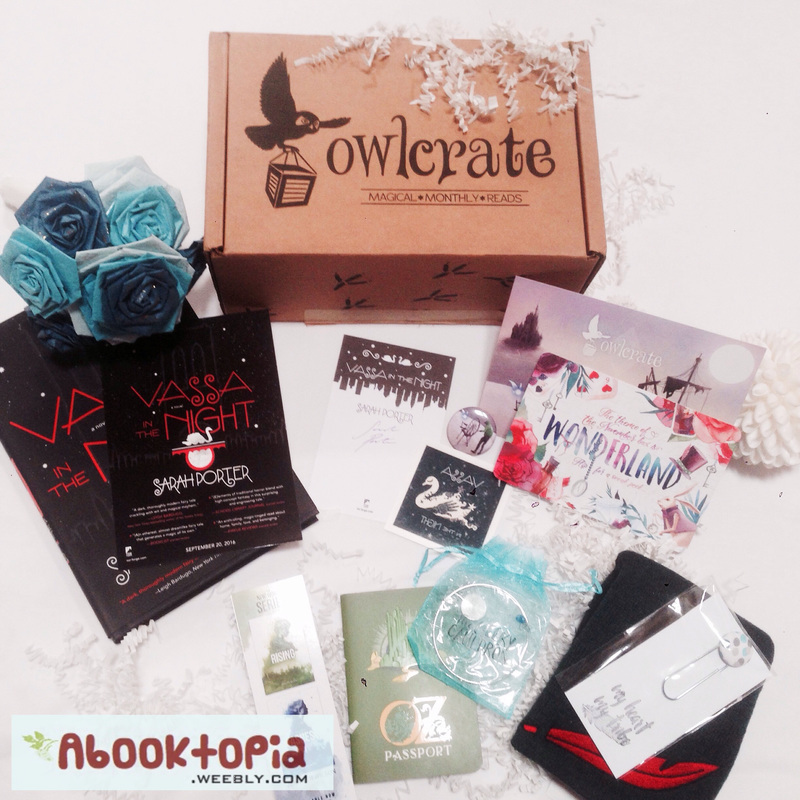 For those of you who do not know, OwlCrate is a YA book subscription box that supplies newly released YA books with 3-5 bookish merchandise and goodies. Each crate costs $29.99us shipping ($6.99 to US, $10.59 to Canada, $19.99 Worldwide). 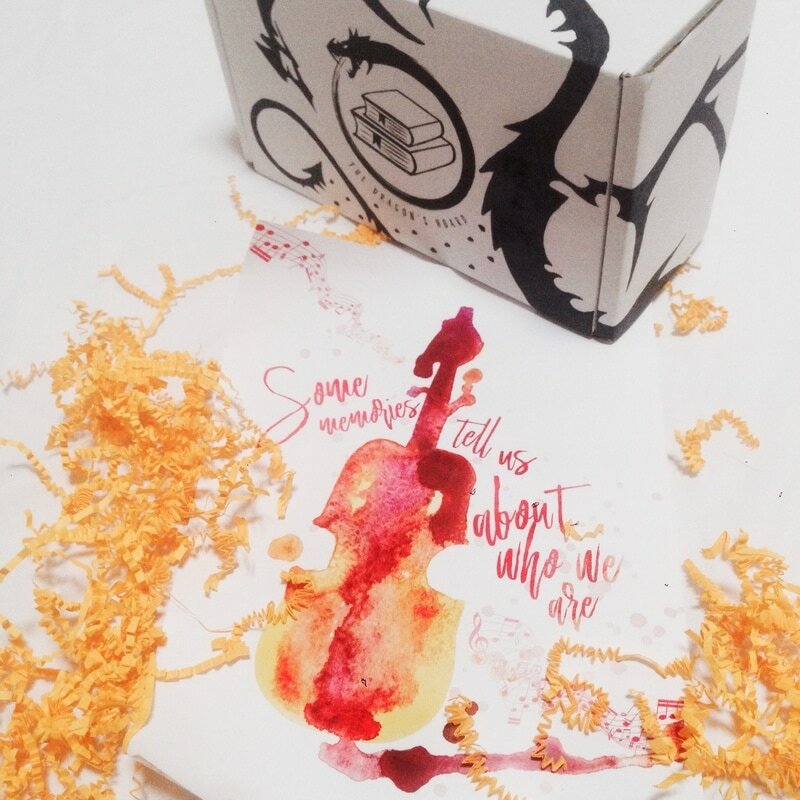 Each box comes with a card detailing the items included and about the month’s chosen theme. Also please note that the photos below do not do the Neverland Beanie justice. You can check out a store photo of the product here. Upon appearance, the crate arrived in pristine condition with neat shipping details on the back of the box, sealed shut for safety. The design (as you can see in the photos below) is decorated with simple designs that are eye catching and presentable, worthy to be placed upon a bookshelf for display. The box itself is quite study and well made. 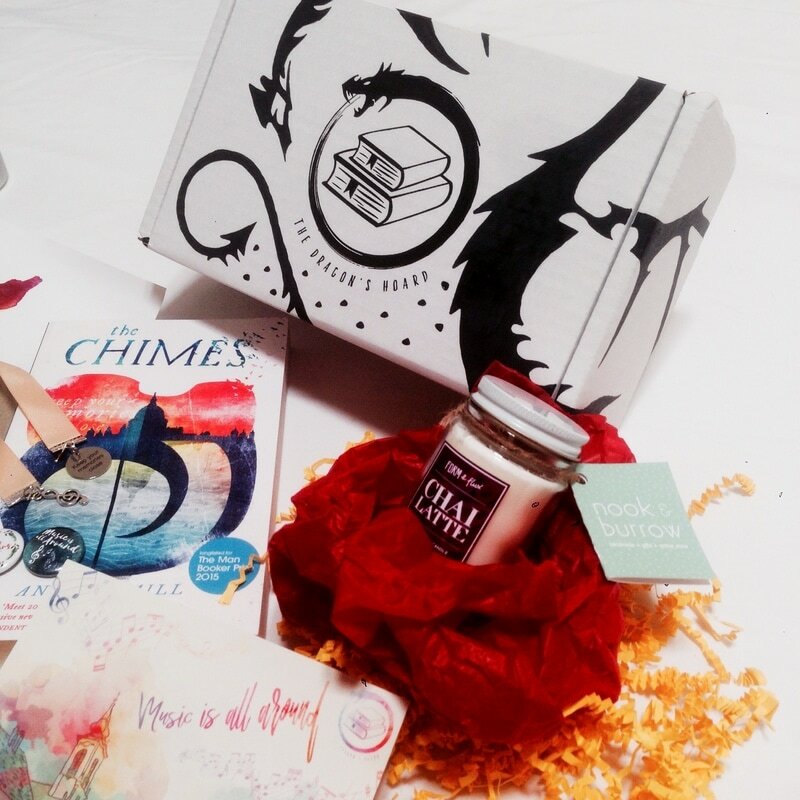 Inside the box you’ll find a number of bookish items based on the crates theme alongside the main item, a new highly anticipated YA read. The hardback book you receive is guaranteed to be a new release that comes with a signed book template by the author that you can stick in, and a pre-scanned letter from the author as well that is exclusive to OwlCrate. 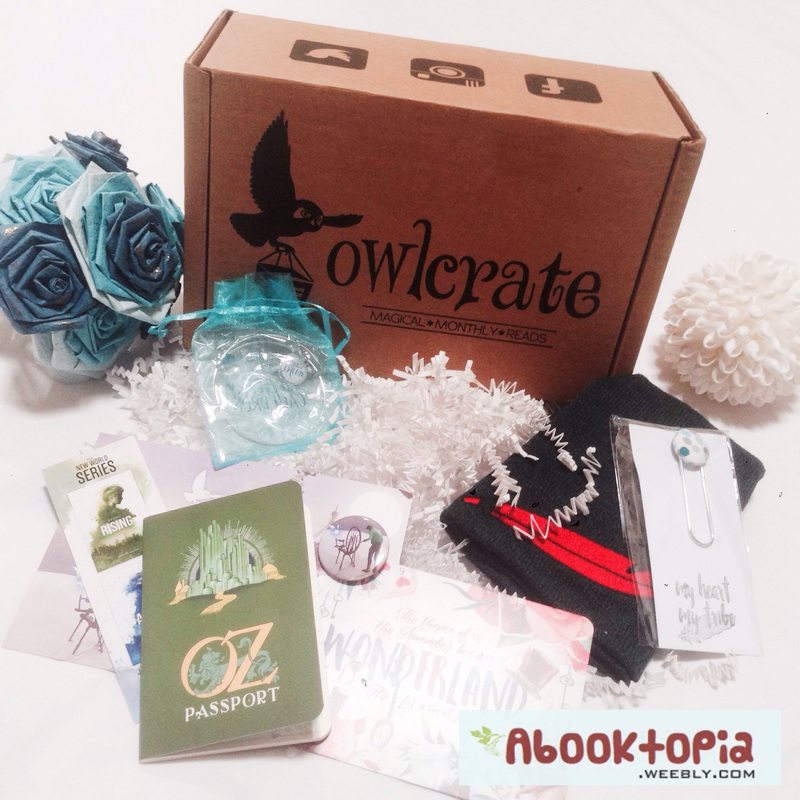 You also receive an exclusive OwlCrate pin (that is a new edition to the boxes) that is adorned with the same design as theme card and on the edges of the pin it states the theme, and the number of the OwlCrate edition based on each month. 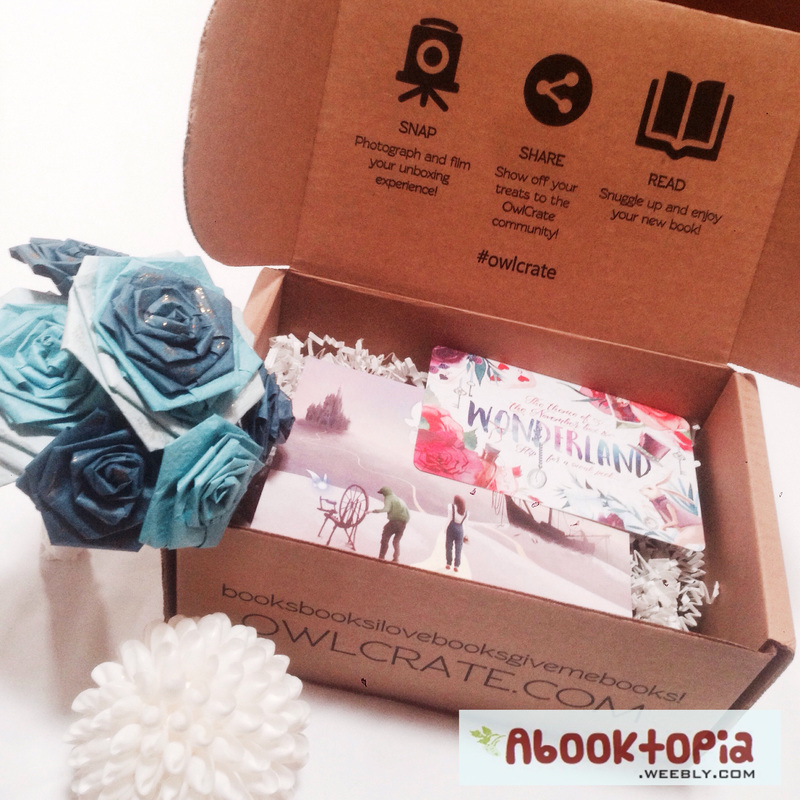 OwlCrate was created to share the joy of reading with the world. We believe in the importance of literature, and the magic of the written word. Stories help to expand our minds, expose us to new experiences, and show us that we're not alone. But we also know that reading can often feel like a solitary activity, and we wanted a way to bring book nerds together. 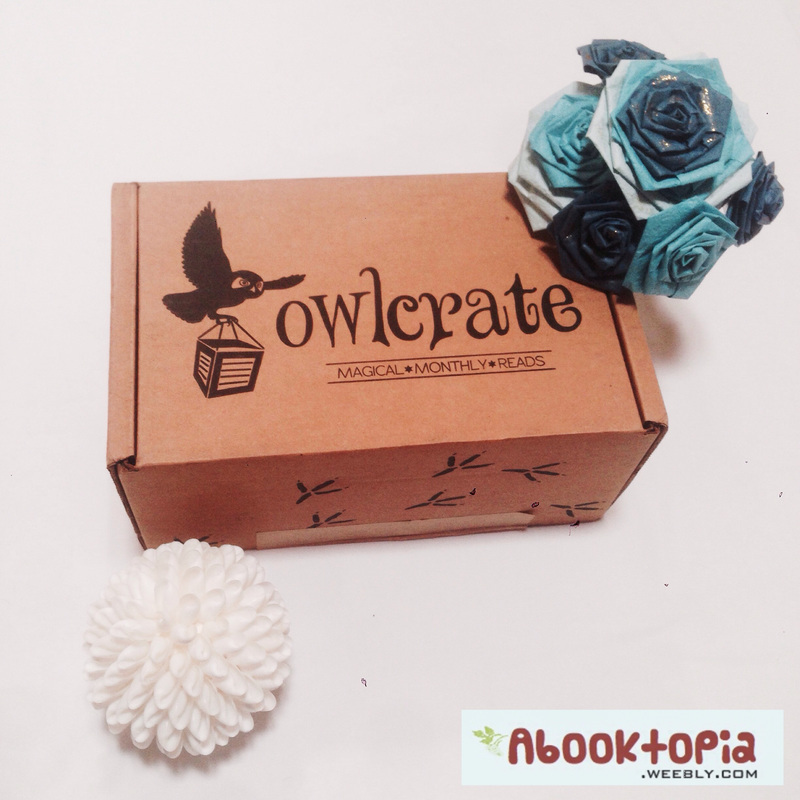 By sharing the fun of unboxing your OwlCrates, as well as reading each month's chosen novel along with other members, we hope you find a safe and happy place among our community. 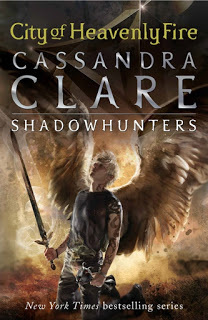 ​Fans of Cassandra Clare’s Shadowhunter Chronicles will cherish this exquisite adaption of The Infernal Devices: Clockwork Angel, in manga form. 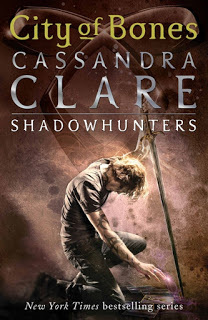 I am so ecstatic that this series has been adapted this way, as I personally cannot stand the ‘hideous’ comic adaptions of books I love, as they tend to ruin my views on the characters; a tad bit. But a manga adaption? I am all up for that for I am in love with the gorgeous artwork and I’m not even a manga reader myself. The Infernal Devices is a steampunk fantasy, which takes place in London, 1878. The manga stuck true to the original books and even included phrases from them, making it a perfect adaption that follows the series accurately. The funny scenes and lines still cracked me up and I adored seeing how the manga displayed each characters emotion dramatically. I was overjoyed with the illustration in this book and the way my favourite characters were presented. However there was one character that looked out of place unfortunately, Henry. It seems as if his character was drawn for comic relief with his childish face with lack of detail. I honestly don’t know how I feel about the way he was drawn but I can kind of, sort of, understand why his particular character was drawn in such a unique way as throughout the book series, Henry Branwell’s character was underestimated by the Clave and many who did not know him thought of him as a fool when in reality he was a genius at work creating new technology that would change the shadow world forever and help aid the shadowhunter’s in their tracking of demons for generations to come. Henry’s character can come off as a little childlike in the midst of him getting excited about his new ideas for inventions, but how could one not get all giddy at the thought of the possibilities? Especially when his inventions prove to be of value to the Clave. Overall, Hyekyung captured the characters quite perfectly and they were how I imagined each of the characters to appear which was fantastic to see. Hyekyung did a good job at carefully selecting what scenes needed to be included, as I know that not every scene could have been included in this adaption. This manga is the perfect refresher for The Infernal Devices series if you want a quick recap and read of the series and cannot recommend purchasing a copy enough, for the images are striking to gawk at. However, I do recommend reading Clockwork Angel first by Cassandra Clare as it provides one with a lot more background information that is skipped out on in this manga adaption. How do I even express my deep and burning love for this book? Samantha Shannon has truly created a masterpiece filled with such elaborate world building. I will admit it does take one a while to adjust to the world setting, but once you do, you will assimilate perfectly into the world of Scion. It is the year 2059, in London, England. The world is a place where gifted humans known as clairvoyants can connect with the æther, allowing them to manipulate ghosts and objects with the sheer power of their minds. Paige Mahoney is a clairvoyant known as a dreamwalker who is able to move in and out of minds, touching their dreamscapes. She commits high treason just by existing for all clairvoyance is prohibited and downright sin in Scion. Being out-casted by society, clairvoyants are forced to join the criminal underworld of Scion London known as the Seven Seals. As a part of the syndicate, Paige works for the notorious mime-lord known as Jaxon Hall and scouts for information as his mollisher and Underlord heir. She is his most prized possession for her voyant abilities are of the highest order. Paige has managed to stay undetected her entire life under Scion’s radar but it isn’t until she fatally unleashes her abilities in a life-threatening situation against two officers, does her abilities become discovered by the government. Hunted down and thrown into Sheol 1, a secret prison colony run by a race of beings known as the Rephaim who survive on the auras of humans, Paige is determined to escape and expose the truth behind the government. As part of the sentence to all clairvoyants captured and sent to Sheol 1, they must abide by strict rules of the Rephaim and be assigned to a keeper who determines your every action and when you may eat and sleep. Paige’s Raphaite master is Arcturus Mesarthim, known as Warden for he is the Blood-Consort to the Blood-Sovereign, Nashira Sargas. Though the Rephaim are cruel and malicious towards their voyants and show no mercy to those who do not abide by their command, Paige’s keeper, Warden, however values her mental health and encourages her to develop her dreamwalking abilities beyond what she believed she could ever have achieved. Warden merely wishes to be a teacher who can broaden her skills, rather than a keeper that is to be fear. Despite Warden’s signs of redemption, Paige is reluctant to trust the Rephaim that keeps her captive. The amount of imagination and detail that is expressed all across the pages throughout the book is mind-blowing and stunning as the world building is intensely nuts, yet perfect. The characters were loveable and each had their own unique personality and background. In fact, you couldn’t help but also admire the cunningness of some of the more villainous characters and kind of care for them, yet hate them for all that they have caused. The Bone Season is one of the most richly crafted worlds I have ever come across for it is richly detailed orientated. 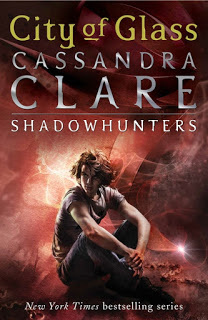 ﻿Walker Books Australia﻿ have sponsored this amazing giveaway of the newly redesigned set of The Mortal Instruments by Cassandra Clare. This set of six books is complete with the new gorgeous covers and spines that are a must have for every die-hard fangirl and fanboy! Lastly, No Cheating! Thank you. If you have any questions regarding the giveaway or my blog, merely shoot me a message in the comments section or contact me through the Contact Form on my Blog. or the first time, fans of Sarah J. Maas's sweeping New York Times bestselling Throne of Glass saga can experience the vivid imagery of her expansive world. 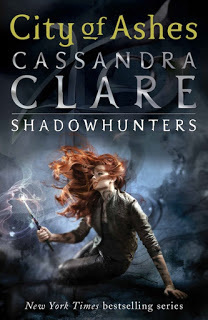 Celaena battling the ridderak in the catacombs, Chaol in the gardens of the glass castle, Manon riding her wyvern through the Crossing, and many other favorite moments, characters, and objects come to life as readers explore the vibrantly detailed realm of Throne of Glass. Stunning original black-and-white drawings will bring fans deeper into the series than ever before-making this a must-have companion to Sarah J. Maas's beloved books. If I wasn’t on board with the trend of adult colouring books, boy am I now. Especially since it has seeped its way into the book fandom community! In all honesty, I had no clue that there was to be an adult colouring book for Throne of Glass, to be released alongside Empire of Storms, until it rocked up in my mailbox as a gift from Bloomsbury, which was a lovely surprise. You could say I flicked through the pages of this colouring book multiple times when I first got it and still continue to do so, every now and again. I adore how there are snippets of the story on the left hand of the pages to explain each scene that is drawn and what is happening in the picture and what part of the book it’s from. Although I love this book, there is one problem… I DON’T KNOW WHAT COLOUR EACH OF THE PICTURES AUGHT TO BE. HELP ME. I NEED TO KNOW. But other than that… This colouring book is perfect and at least the little story snippets to the side do come in handy at times for colour guidance, which is what I, oh so desperately want and need. So in other words, you could say I won’t be colouring in this copy any time soon unless I purchase a second copy and some fancy colouring pencils. Probably watercoloured pencils or textures. For those of you who have not yet finished reading Throne of Glass through to Empire of Storms, I recommend not reading the snippets as they do contain some major spoilers, so just bare that in mind if you are partway through the series. The artwork is gorgeous and I’ve found it to be fairly easy to identify whom each of the characters drawn represent. Oh and did I forget to mention the quality of the pages? The colouring pages are quite thick with a nice smooth texture, easy for colouring in, and the thickness ensures that no colours seep through the back of the page and unto the other side or that rough bumpy indentations appear on the other side from the pressure of the pencils. Which is something I’m really happy about. But there is one thing I have observed, and that is the fact that some of the pictures in it don’t quite seem to fit in the rest as they lack a bit of detail and the drawings seem to be a bit larger in comparison to the rest of the artwork.